Today I wanted to share a deep knowing that’s been growing in me for years and now I finally understand its truth. What I say/think and feel about me, you and my world has a funny way of showing itself as true. Here are the words I wrote to myself this morning that strengthens who I am and what I choose to experience in my daily life. Today I make myself feel good in these ways…. Today I focus on enjoying my day by having my best day yet in everything I do. I consciously make the best of each moment of my day. I embrace each moment to the fullest than I can. This is my world, my moments , only my clarity matters to me. I invite you to reflect on how ‘PowerFilled’ Your words can be. 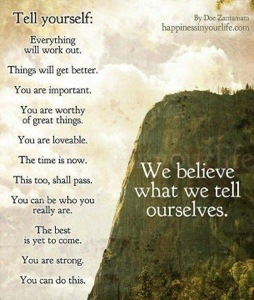 What are you saying/thinking/feeling about yourself in this moment? And what are you desiring to experience in your life right now? Yes right now not tomorrow or years from now. Be in your now and choose words/thoughts/feelings that will in-power you, strengthen you, and rise you to the level of your being true to you.